If you run a blog or information site you may be interested in the Just Answer (justanswer.com) affiliate program, having recently purchased USAGardener.com the last thing I really wanted were questions emailed to me about gardening that I have neither the knowledge or inclination to deal with so one possible idea is to use the JustAnswer affiliate program. I was already using this on on few pet sites and it generated the odd sale here and there but putting it on the contact page on USA Gardener appears to be bringing in a sale or two a day just now, nothing massive but convenient and functional. Ideal if you run an information site and could offer an extra income source as well as take care of particular visitor questions without getting your hands dirty, I’m making sales of around $10-$16 and from that get $1-$3 per sale. The internet is awake and so are most who live in and around it, while it’s rare to find a high ranking site not monetised with Adsense or the like there ways to buy websites and advertising that not may strike as obvious. Competitive markets like insurances and debt management look like they will thrive in 2009 while the mortgage market suffers, approaching a top 10 ranking website for debt management will NOT provide you with a cheap gem to buy but that doesn’t mean traditionally difficult markets are to be avoided. Thinking outside the box can offer cheaper inroads to high paying niches and the example I will give can be applied as always to many ideas and markets, for this one let’s presume you want to tap into the high paying debt management market. Liken your task to that of a profiler who works for the police, if there had been a complicated murder and the police call in a profiler to get a profile of the murderer they expect to be given an overall picture with accurate behavioural detail. The profiler won’t tell the police to wait until there is another murder and then you’ll find them, instead behavioural patterns are given to try and find the offender and narrow them down through everything else apart from the murder, so work, social life, habits and hobbies. Take this back to your debt management leads, worth say £50 a pop, people who are heavily in debt have a profile, finding them at the top 10 ranking sites for debt management would be expensive, as it would for finding them through Adwords. You can however find these people at other cheaper places through profiling, cheaper websites and cheaper advertising places that have a direct correlation to your desired lead can give you great profit with albeit a poorer conversion rate. People get up to all sorts online and a great many of them fit patterns and profiles. It’s going to be a tough year for many, I know of a few friends paid off and others that have had to take other jobs on less money so while today’s post is nothing new I think it’s worth going over to point out that you can make a couple of hundred here and there and for many that can mean the difference between paying bills and not. Simply one idea is to hand register domain names and sell them for a couple of hundred, try not to presume anything, don’t presume all product names are registered, don’t presume nobody wants to buy and don’t presume it’s a waste of time. With a budget of less than £50 and your time you could research, register and sell domains to very happy people. I would suggest finding a source of ecommerce websites, again for me this would be UK based sites, you could probably use DMOZ as a source. Pick a subject like ‘mobility’. Then find the product pages of the sites and check the names of their products again the whois – with a bit of luck you will very quickly find products available as I did, mobilityvans.co.uk & mobilitywalkers.co.uk, the latter is now part of a £50 per month lease. For example on this page you can see they sell a car caddie and that domain is available. If you chose instead home improvements the first site’s description says “Online store for supplies of timber, sheet materials, specially treated woods and ancillary products” A quick check and you’ll see treatedwoods.co.uk and sheetmaterials.co.uk are available or the 8th company on this list sell temporary window blinds which I remember seeing on Dragons Den, surely temporarywindowblinds.co.uk isn’t available that has to be worth £100 and as I write it is available. Don’t get bogged down with search volumes or other unrelated data – your selling the domain only, the name of a product that companies sell. It’s important to be courteous and reasonable, point out that you own it and are selling it for a fixed price of £100 or £150 or whatever your number is, a fixed price lets them know your not out to rip anyone off and gives them a very clear decision to make, I don’t think it would take long to get a bite, you really don’t have much to lose apart from your time. A comment from Rich Schwartz on his sale of property.com made me realise how far domain name sales have to come and how far they still have to mature. Specifically contracts and the negotiations of a sale of your assets. We need to look out at other industries and learn from the way deals are done, I have already talked about leasing which I believe has a big future, perhaps dictated by added value such as rankings, a shop would have added value through it’s location and passing trade, a domain with a small site that ranked would mirror that location and passing trade adding real value and making it an asset that would be attractive to businesses. Chitika are usually one of my top 3 money makers. Previously , they haven’t converted well on information based sites, kind of like this one. This could hopefully be about to change with their new Interactive Premium Ad units. The units look like traditional text based ads but have a relevent image to the left of the ad text, giving your visitors graphical information as well as getting their attention (a bit like the old trick some publishers with manually did Adsense until Google forbade it). The image to the right is how the unit would/could look on Self Made Minds, I had to use an image rather than the unit for reasons I’ll explain later. Presently the unit will only show to your US traffic and even then it’s described as behavioural so will only show to “some” of your US visitors. From our tests and observations it looks like one of the key factors to whether the ads are shown is based on the referrer, primarily is the visitor from a search engine, if so show the ad and base the ad content on the keywords used to find the page. This leads to highly targeted ads which should result in a higher than normal CTR and eCPM. I’ve only been testing these for a couple of weeks but performance so far has been an improvement. I’d recommend at least giving them a test (especially if you have a none product based site that performed badly in the past) and make sure you specify a default ad (instructions here) to monetise the rest of your traffic. 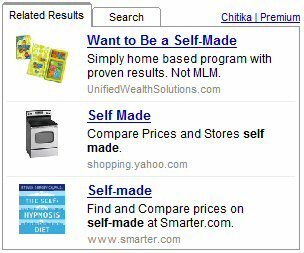 One of Anybody can apply to Chitika and if you’re already with them, the new ads in the Get Code section. Making money from classified sites. I stumbled across an ingenious way to make money from a site last week and it’s something I plan to possibly try out and put into practice when I get a chance, if you already know about it then I apologise but it did seem rather a sneaky and clever way to generate income while on the face of it looking after your visitors interests so worth sharing. It goes like this, you run a free classifieds website letting buyers and sellers list their ‘for sale’ and ‘wanted’ adverts in a niche, be it fish, dogs, birds, cars, music or whatever! It’s a free service and you want to keep it clean and user friendly but you also want to monetise the traffic without plastering Adsense everywhere! When people place adverts for unwanted goods or pets they have bred they may be wary about giving out their phone number, fear not, your classifieds site operates privacy protection so that their phone number is not actually displayed on the site, instead an 07096 number is displayed (in the UK), this number forwards calls on to the advertisers real phone number and costs £0.50 per minute generating shared revenue for the website owner. This post is not meant to be a scientific experiment, I know there are major other reasons for the two sites I mention not being equal but it does demonstrate to some extent a few of the cliches you hear a lot, if your thinking of putting up a low/zero maintenance information website you have a couple of options. I’m still having a crazy Christmas season here, I have another week of long days and will then be taking my daughter and a couple of close friends to Lapland for a Winter break (I can’t wait). One of the affiliates I’ve been pushing big time this season is Amazon and they are now (normally) my forth highest daily earner (after Adsense, Chitika and Commission Junction). What impresses me most about Amazon is their conversion rate which for me currently stands at over 9% and looking at their site I can see why, I reckon many on-line retailers could learn a lot from from Amazon.